If you have a freshwater pond that you would love to stock with fish or you are thinking about putting in a Koi pond right now, you will find that Koi make for some of the most beautiful choices you can find. Koi are widely regarded to be among the most popular freshwater pond fish in the world and they are known to live a long life and are fairly easy to care for. These domesticated fish descended from common carp, and you can find them in solid colors or in a wide array of patterns that involve rich reds, oranges, whites, silvers and blacks. 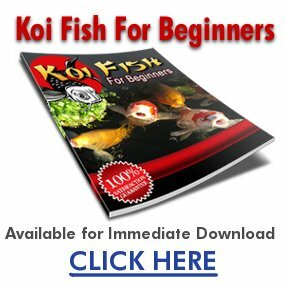 If you are interested in keeping Koi, there are a few things that you need to be aware of. These fish will grow very slowly over many years and the more room that you can give them, the better. They do well in ponds with at least five hundred gallons or more, and you should keep an eye on them to see if they are outgrowing their pond. Koi that grow too large for their ponds are often listless and unhealthy and if you seem them grow too large, it might be time to create them a new pond, or to give them away, and then replace them with smaller koi. When you are thinking about raising Koi, remember that they are cold water fish; they are going to thrive in temperatures between 61 and 75 degrees Fahrenheit. They can be kept out of doors in the winter, though preparations need to be made. As the winter goes on, you will find that Koi will go into hibernation. Their digestive systems will slowly empty, because if food remains in their bodies during their hibernation, it can rot and make them sick. Because of this, you should never feed a Koi when it is too cold out. Remember that the deeper their pond is, the happier they are going to be; your Koi pond should be at least three feet deep. You should also think about what you are going to feed your Koi. There are definitely mass market brands of Koi food out there, but remember that you should choose one that has all the nutrients that your Koi needs. Koi are omnivorous and thus are not terribly picky eaters especially as they are also scavengers. In addition to the Koi food that you can buy, you can also treat them to snacks that come from your dinner table. Shrimp, fruits, bread, and even things wax worms and nightcrawlers can be a welcome change in your Koi’s diet. Take a moment to learn more about the Koi that you are thinking about keeping and to make sure that you can care for your fish correctly!